Last night’s episode of Duck Dynasty showed how Willie and Jase Robertson settled their beef in the only way a redneck knows how. “As an older brother, Jase has always acted like he’s better at everything,” complained Willie Robertson. “The whole town? 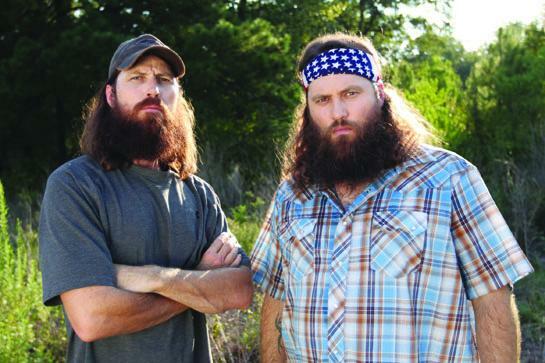 You don’t make the best burger in the family!” Jase Robertson told his younger brother Willie. At first, the two asked Uncle Si Robertson to settle the feud but Si was no help. When asked if he preferred Willie’s burgers to Jase’s, Si Robertson answered he preferred Phil’s first and then Miss Kay’s. “I have to eat one from both of you,” said Si Robertson. “In a burger-eating competition, there’s no question Willie is your man but this is a burger-making competition,” said a confident Jase Robertson. While the two competitors made their way to the grocery store to pick up ingredients, youngest brother Jep Robertson got roped into helping his father get rid of his unwanted junk. “Around here, stuff tends to pile up,” said Phil Robertson. When Jep Robertson showed up looking for old newspapers for his wife Jessica to use in an arts and crafts project, his father Phil capitalized on the situation. “When my son comes rolling in, I have to seize upon the opportunity,” explained Phil Robertson. But Jep Robertson wasn’t falling for his father’s old tricks that easily. Phil Robertson tried to unload old phonebooks and other paper goods on his son, but Jep stayed true to his mission and only accepted the paper. “I’ve seen my dad try to set this kind of trap before,” Jep Robertson said. But it wasn’t long before Phil Robertson had Jep lugging a pick up truck full of junk to the recycling center. It wasn’t until Jep Robertson had almost finished unloading the old newspapers, did Phil reveal they were covered in rat pee. “Subdivision people, [rat pee] runs through them like sauce in a cat,” Phil Robertson said as he warned Jep to wash his hands well after touching the paper. “Most dads would just ask for their sons help,” Jep Robertson said. Back at the Duck Commander warehouse, no duck calls were being made per usual and the boys began their cook off. The competition got serious when Willie Robertson asked to borrow Jase’s pan. “[Willie] wants to share [a pan] in a burger cook off?” a bewildered Jase Robertson asked. In the end, the two brothers only proved that the burger making business is better left to Phil and Miss Kay. Even Duck Commander employee and food enthusiast John Godwin couldn’t stomach their patties.